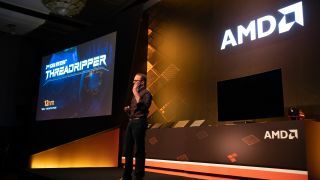 Of all the announcements we’ve been waiting for at Computex 2018, AMD finally making its Ryzen Threadripper 2nd-generation processors official was likely to be the biggest one – and AMD delivered. At the highest end, AMD says its Ryzen Threadripper 2nd-generation processor includes a beastly 32 cores and 64 threads. For comparison, the last-generation Ryzen Threadripper 1950X featured 16 cores and 32 threads. Unfortunately, AMD didn't disclose any details of clock speeds or even a new model name. That said, AMD revealed that, as with Ryzen 2nd-generation, the next series of Threadripper processors are build on a 12nm architecture and feature the enhanced overclocking capabilities. AMD says the Ryzen Threadripper 2nd-generation family will launch in the second half of 2018, and that the aforementioned 32-core processor is due to arrive in the third quarter of the year.